This incredible Broadway play was made into several equally good movies over the years, my favorite being a gender-switch for the main character. It was written in 1928 by Ben Hecht and Charles MacArthur. 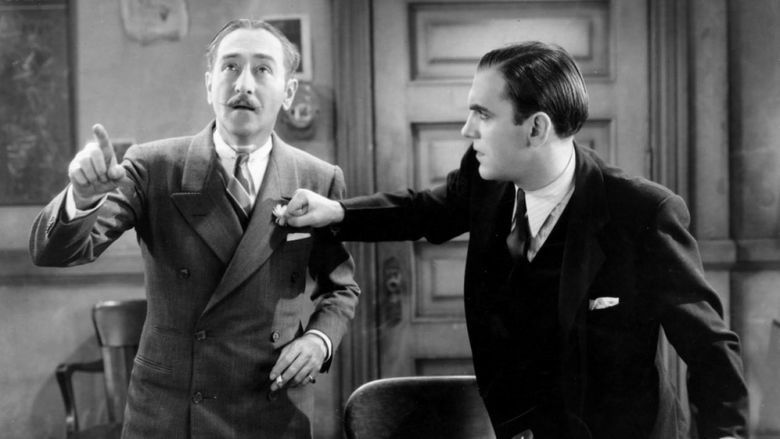 The first movie to be made was the faithful “The Front Page” (1931) directed by Lewis Milestone and features Pat O’Brien and Adolphe Menjou. It’s very much the play, with a lot of great dialogue and great character actors. It went on to 3 Academy Award nominations. My favorite one was next and it features one of the most ingenious casting choices of all time when Howard Hawks decided to change the role of Hildebrand Johnson into Hildegard Johnson and cast Rosalind Russell. It was a brilliant move to have the two main characters divorced and sparing. Cary Grant plays the Walter Burns role perfectly and it is my FAVORITE of all of Cary Grant’s performances, in a plethora (Jefe, what is a plethora?) of perfect performances. 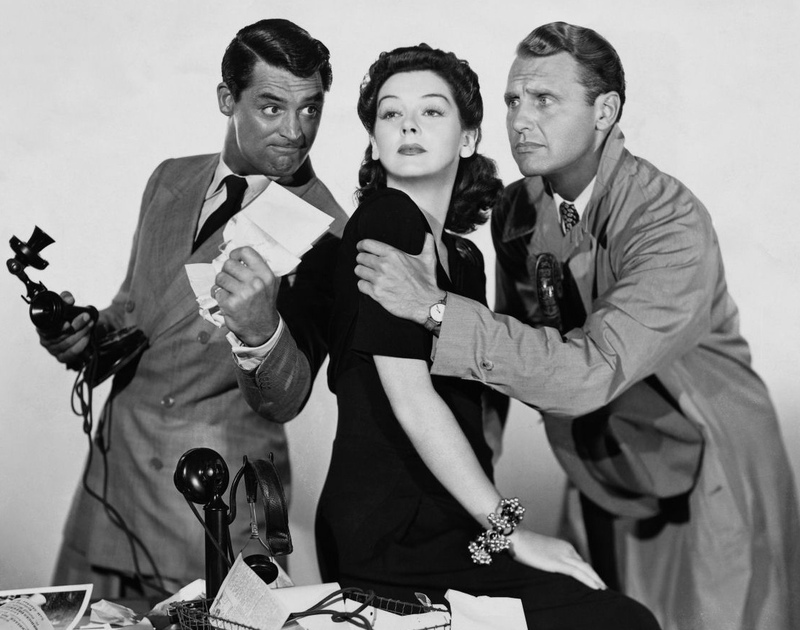 They also switched the title to “His Girl Friday” (1940). I should mention that Howard Hawks very much wanted to keep the dialogue like it was in the play where it was fast paced and had a lot of the characters talking over each other. Because of this, Hawks wanted each actor to come up with improvised bits and action for each of their characters. 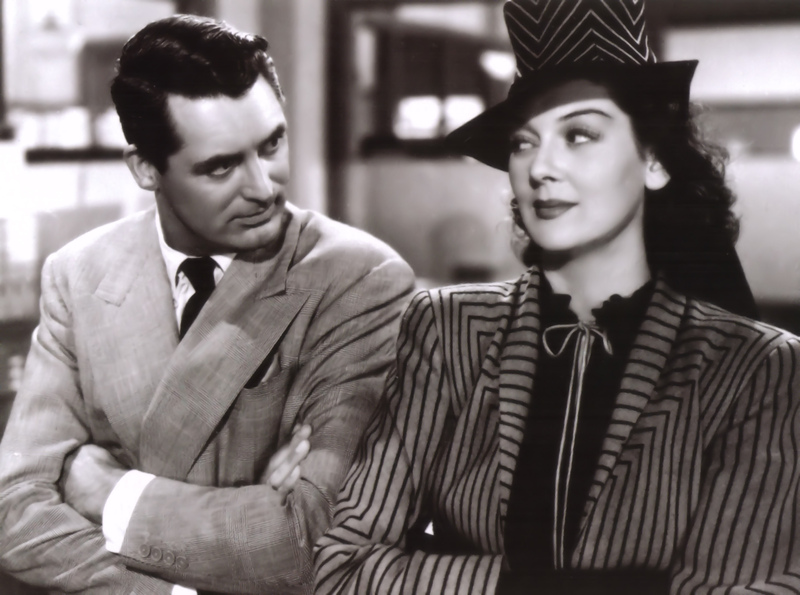 Rosalind Russell, not to be outdone, hired an advertising writer that worked with her brother-in-law to make sure that her “improvisations” were especially witty and Hawks never caught on, but Cary Grant did and every morning would ask her, “What have you got today?”. She was also perfectly cast and has fantastic chemistry with Grant and her fiancee in the film, Ralph Bellamy. 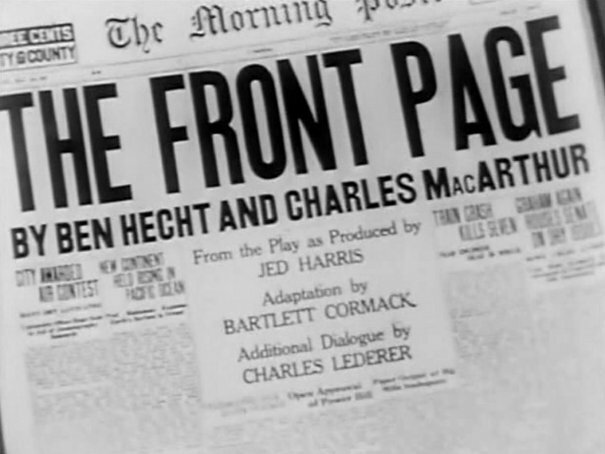 The next version of “The Front Page” (1974) was directed by Billy Wilder and featured the male roles intact again with Walter Matthau and Jack Lemmon paired up. The pairing was so successful that they would go on to do a total of 10 movies together (although they do not have any scenes together in JFK) and were very good friends off camera as well. Jack Lemmon also directed only 1 movie his entire career, and he made sure the star was none other than Walter Matthau. It was “Kotch“. 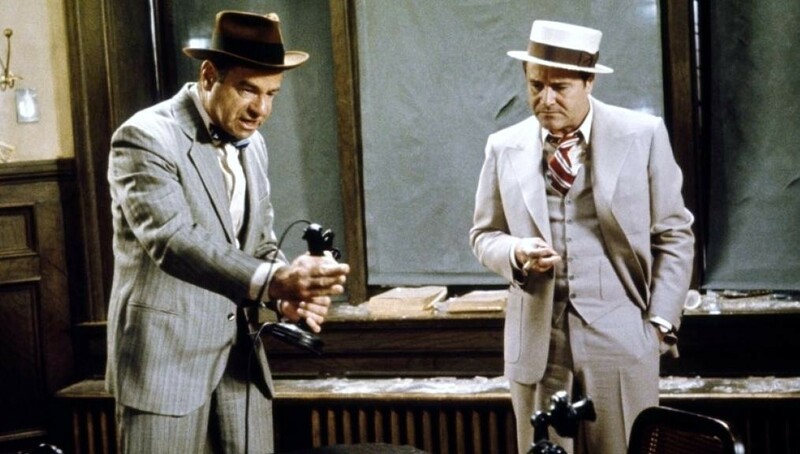 Lemmon would go on to say about Matthau, “Walter is a helluva actor. The best I’ve ever worked with.”. 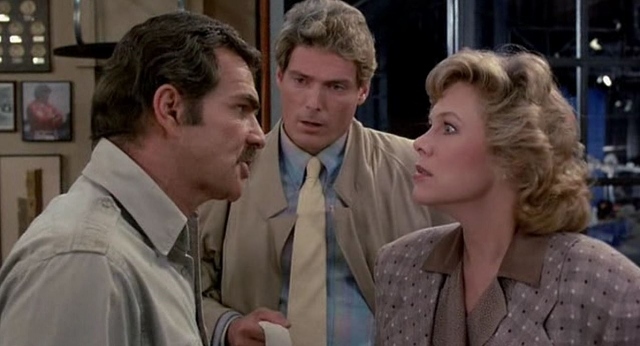 The last one really worth mentioning and that seems to have been really forgotten over time is the fabulous, “Switching Channels” directed by Ted Kotcheff and it switches the gender roles again with Kathleen Turner playing the Rosalind Russell role. Burt Reynolds plays the Cary Grant role and Christopher Reeve plays the Ralph Bellamy role. This time the setting has been changed as well to be in the world of broadcast news and so a lot of the newspaper men chatter has been completely cut from this version. It really focuses in on the relationships and works well, I think. All the actors are fantastic in their roles. Now all of the other previous versions were pretty big hits, except this one and it’s a real shame as this is highly under-rated, in my opinion. The failure may have been due to the release of the very popular and critically praised Broadcast News months before. People thought it was too much of the same thing. Burt Reynolds grabbed this film because Cary Grant was a big inspiration to him for years and this finally gave him an opportunity to play a role of his. I think you can really tell in this film that he studied Cary’s performance as it reflects his own. Burt Reynolds and Cary Grant are two actors that I can honestly say, could do any genres as they were equally good at comedy, action, romance and drama over their careers. Bringing Up Baby, What’s Up, Doc? Shazam or Captain Marvel? Will The Real Captain Marvel Please Stand Up? Why is No-one Talking About Logan Marshall-Green in Upgrade? What’s Up, Doc? Behind the Scenes With Barbra Steisand, Ryan O’Neal and Peter Bogdanovich | Brothers' Ink Productions on Bringing Up Baby, What’s Up, Doc?